Spring 2017 is upon us and with it comes warmer temperatures and a "hot" season of our fundraising initiatives! These include: new projects, partnerships and events - including our 18th Annual Theatre Event featuring "Miss Saigon." Not only did the month of March signify the beginning of a new season, it also kicked off Macy's Annual Bag Hunger campaign. Recently, and as part of their annual Bag Hunger program, employees from Macy's also spent an afternoon packing 200 "Easter Dinner Baskets," chock full of ingredients to make a delicious dinner, and distributed the baskets to Carter Burden Network and the Grandparents Advocacy Project. 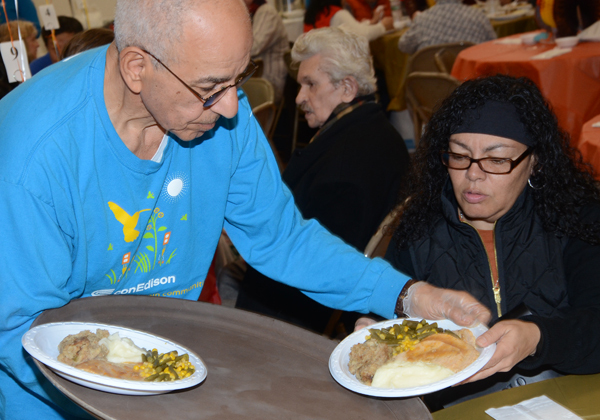 While typically celebrated in the fall, the spirit of giving thanks was in the air at our Annual "Thanksgiving in February" celebration during the last weekend in February. This past March, we held our Annual "St. Patrick's Day Luncheon," presented by Macy's as part of their Bag Hunger month. Guests at Encore Community Senior Center in Midtown Manhattan were treated to traditional Irish fare and the entertaining atmosphere of fellowship. We look forward to a wonderful year ahead filled with exciting new volunteers/supporters, projects, milestones, and much more. Remember: YOU make it all possible with your support and commitment to our mission.